Are you trying to get organized and in need of filing solutions? The Office Barn in Goshen, IN has a solution for you. We have a variety of vertical file cabinets and other office furniture for sale in Goshen, IN, to fit your needs. Heavy Duty Steel Ball Bearing Suspension. High drawer sides for easy filing. Core removable locks. The Office Barn offers used and second-hand office furniture for sale. 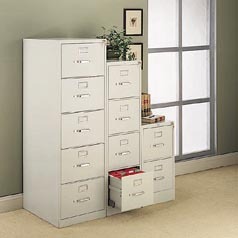 Our file cabinets are available in a variety of sizes and colors. If you are looking for the perfect filing solution in Goshen, IN or the surrounding areas contact us today or visit us for pricing and availability.